Welcome to that rare gem; the one you’ve been searching for but at an absolutely incredible value. 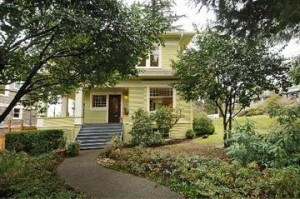 This gorgeous 1906 Craftsman home is blessed with features rarely found. Enjoy a wrap around front porch which welcomes you into the formal entry with her grand staircase on display. Once inside, you’ll feel the warmth and comfort surround you with an inviting circular floor plan. Intricate details are found in the millwork, moldings and box beams. This bright and spacious home boasts all 3 huge bedrooms with oversized closets, a sun room and one very large full bath upstairs. The main floor oozes with light filled rooms, thanks to the abundant windows. A sweet office is just off the dining room. The dining room itself has an exquisite bay window and original built-in leaded window cabinets. Pocket doors separate living from dining room. The brand spanking new kitchen is the icing on the cake! For the true gourmet and easy living, an island with built-in cabinets, shelving and microwave w/granite counters and breakfast bar are just the beginning. Coveted 4 burner gas stovetop with hood, fridge to match cabinets, some of which are glass, thoughtfully designed storage spaces, walk-in pantry, mud room and work station to boot! You will love entertaining in this exquisite home. Newly landscaped backyard, huge corner lot and possibility to build a garage (buyer to verify). I guarantee, you will fall in love!